I've been using the cooksalot name since the mid 80's. Then I was off line for a few years. I was back in full form in 1994. I notice a few years ago sites I had never been too were saying my username was taken. WELL I'LL BE! That sure wasn't me! So here I am setting the record straight. I AM THE ORIGINAL COOKSALOT! Found this on Google+. I am so going to try this one out sometime soon. Now this is an easier version of my favorite recipe. If I'm ambitious and cook the noodles I won't add the water to the lasagna before baking. uncooked lasagna noodles to save a step. and red pepper; set aside. 3. Spread 2 cups beef sauce over bottom of 13 x 9 inch baking dish. lightly into sauce. Top with remaining beef sauce. under to catch spatters and boil overs. 15 minutes; cut into 12 (3 x 3-inch) squares. I know totally off the wall title. But I saw this recipe on the back of the Aunt Jemima Pancake Mix box. The picture looked so good and I had to try it. Of course like the title says bargain shopping. So I had gotten the pancake mix on a Albertson's Bonus Buy, and I thought well I have a well stocked pantry and everything I need. Why not. Now here's the recipe with the changes I made to it, and approximately what it cost me to make it all from my restocked pantry. 2.For filling, combine ground beef and onion in large skillet. Cook until meat is no longer pink. 3.Add peppers and corn, cook 2 minutes over medium heat, stirring occasionally. 4.Add tomato sauce and taco seasoning; cook 2-3 minutes or until heated through. 5.Pour hot beef mixture into 8" x 8" or 9" x 9" square baking dish. Sprinkle with cheese; set aside. 6.For topping, combine pancake mix, milk, egg and oil; stir with wire whisk until large lumps disappear. Pour over ground beef mixture; spread evenly. 7.Bake 30-35 minutes or until topping is golden brown. 8.Sprinkle top with additional cheese, if desired. Cost wise $5.11 just a few cents over the $5 mark. The $5 dinner mom would be proud of me. The boys loved it and even left enough for Phil to take for his lunch. Yep I've been watching "Depression Era Cooking" with Clara on youtube. So I've been inspired to post a quick recipe before I go to sleep. Something for all of us that have been living on tight budgets with hungry mouths to feed. And when those mouths happen to belong to 2 boys that like playing hockey well that's like trying to feed a family of 6! here is my version. Give it a try sometime. the olive oil until the onions are slightly brown (about 10 minutes). about two minutes. Remove from the heat. While you are cooking the onions break the pasta into smaller pieces. extra water, but it sounds like a good idea). Add the drained hot pasta to the skillet with the onions and mix well. Add additional salt/pepper to taste if you want - thats it. Cholesterol; 444mg Sodium. Exchanges: 2 Lean Meat; 1 Vegetable; 6 Fat. Just the thing for a cold wintery Christmas night. Enjoy! Got this cookie batter in the fridge right now. I'll pull it out tomorrow and get it baking. It once started out as 2 separate recipes. I took what I liked best and made my own recipe. So this is my own personal recipe. Enjoy! again. 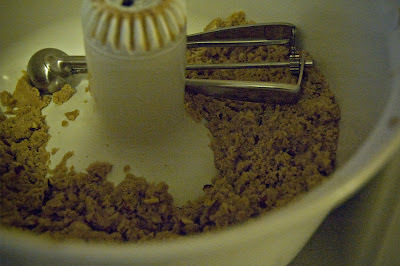 Add sifted dry ingredients to creamed mixture and mix thoroughly. apart on a greased baking sheet. Bake at 350 degrees for 12-15 minutes. 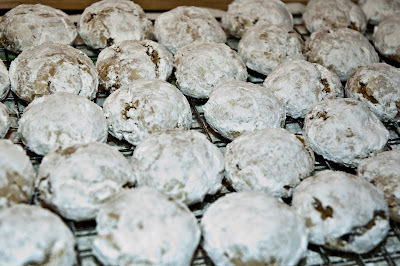 Today the boys and I made Pfeffernusse Cookies. Turns out that I can't find the recipe I used to make all the time, but I found a very close one on All Recipes. I even took some pictures! Don't be fooled the dough will look dry and crumbly. Needs to be that way so it doesn't go flat when you bake it. These are so good they might not make it to the third day of aging.